I used some suggestions from you guys this week, spent a stupid amount of time watching pizza videos on Youtube, and stopped into Trader Joe’s for their crust. Oops. Really though, you just can’t beat their crust. Its fresh, it’s less than 2 bucks, and it works perfectly every time. Oh, can we talk about this Trader Joe’s I went to? I usually go to the one by the Arboretum because it’s the closest to my house (still an hour away, y’all) but we happened to be further south and ended up at one that involved a parking garage and an escalator. And y’all, I expect that sort of thing from Whole Foods but Trader Joe’s? That seems extreme. 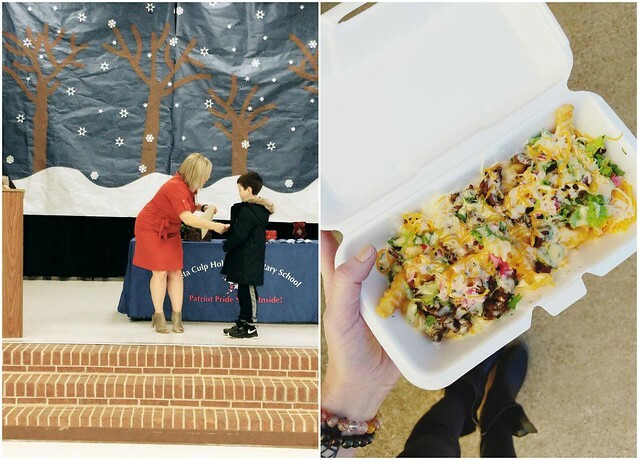 I started the week by bawling in the back row of the 2nd grade award ceremony and then ate my feelings at my favorite local food truck, Korean Kravings. They’re usually on Fort Hood during the week but if you’re local and don’t have access to Fort Hood, watch their FB page – they do a lot of weekend events. The bulgogi fries are everything and they are nicest people. Best thing that happened to me all week was running into this dog at Walmart. 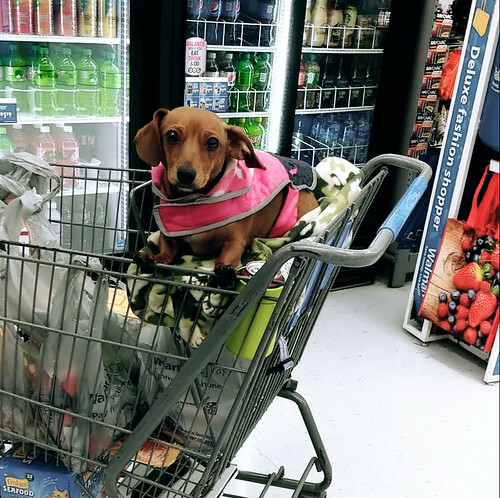 And yes, if you have your dog looking all cute in the grocery store, I’m probably going to take a picture and send it to everyone I know. 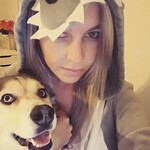 If you recognize her, tell her that I’ve thought about her every day this week. Okay, so I started listening to Rising Strong (because my NY resolution was to listen to more books when I work) and I don’t love it. Should I stick it out? I always love hearing Brene Brown speak so I expected to love it but I’m having trouble convincing myself to listen. That day we stopped into that weird Trader Joe’s? We were down that way because everyone I know has been talking about Phoebe’s Diner. It’s a newish brunch place attached to a gas station and the only sign says “diner” but they have a menu of pretty classic items made a bit more trendy. Like shrimp and grits but made with goat cheese grits. And deep fried sourdough french toast. Stuff like that. I, of course, went for the South First Tots because I am a child and if tater tots covered in anything is on your menu, I’m going for it. 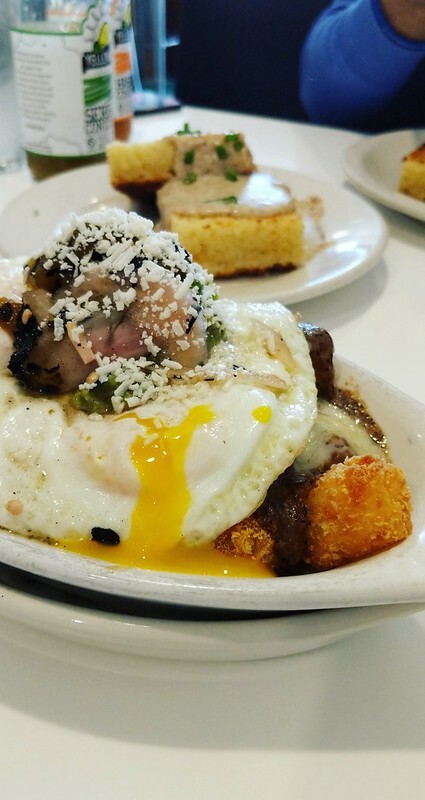 These had red-eye gravy, swiss cheese, a couple eggs, guacamole, and jalapenos. 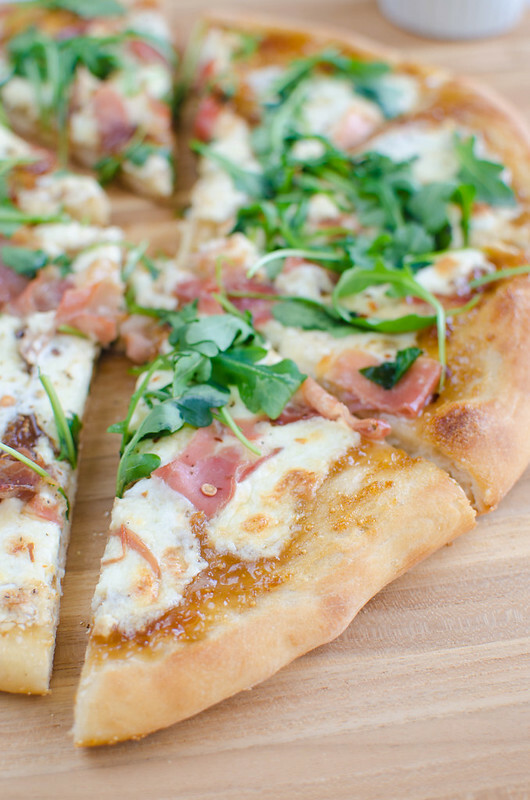 Fig, Burrata, and Prosciutto Pizza! I love this combination for pizza. The sweet and the salty and then a little bit of crushed red pepper on top for some heat? So good. I spent yesterday morning driving to each grocery story in this city looking for fresh figs because I love figs on pizza and aren’t they in season right now? But no luck so I ended up just using some fig jam which totally worked but don’t go too heavy with it or it will get super sweet. If you can’t find burrata, just use thinly sliced fresh mozzarella. So I preheated my oven to 500F like last week and let the pizza stone sit in there a stupid long time and then baked the pizza for about 12 minutes. But it still wasnt getting super brown (I think it’s my oven) so I turned the broiler on just for a minute or 2. Place pizza stone in oven and preheat to 500F. Once preheated, let the stone warm for another 15 - 30 minutes. When ready to bake pizza, stretch pizza dough to desired size and place on a pizza peel or other tool. Spread a thin layer of fig jam onto the dough, leaving about an inch of outside crust. 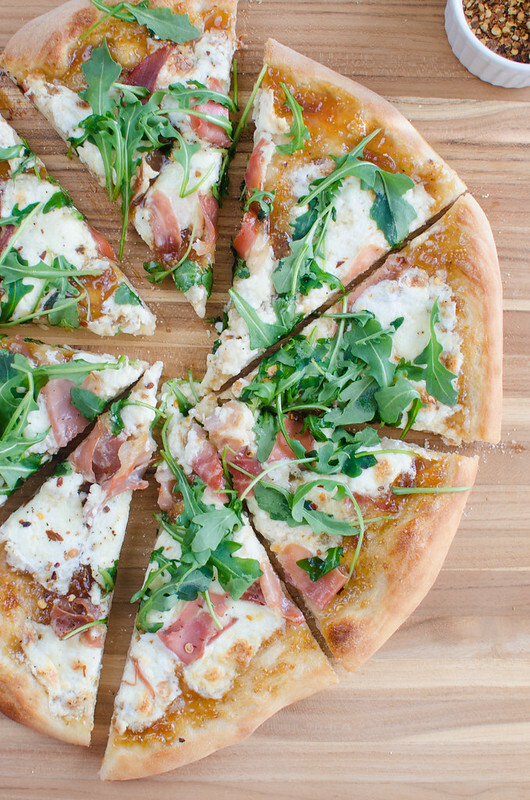 Place dollops of the burrata all over and scatter sliced prosciutto on top. Use a pastry brush to brush the olive oil on the outside crust. Bake in preheated oven for 10 - 12 minutes, until bottom is browned and crisp. Not necessary but makes a pretty pizza: put under your broiler just until the cheese and crust starts to brown deeply, a minute or 2. 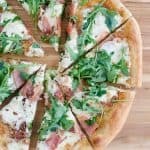 Carefully remove from oven and sprinkle with crushed red pepper flakes and arugula. Slice and serve hot. 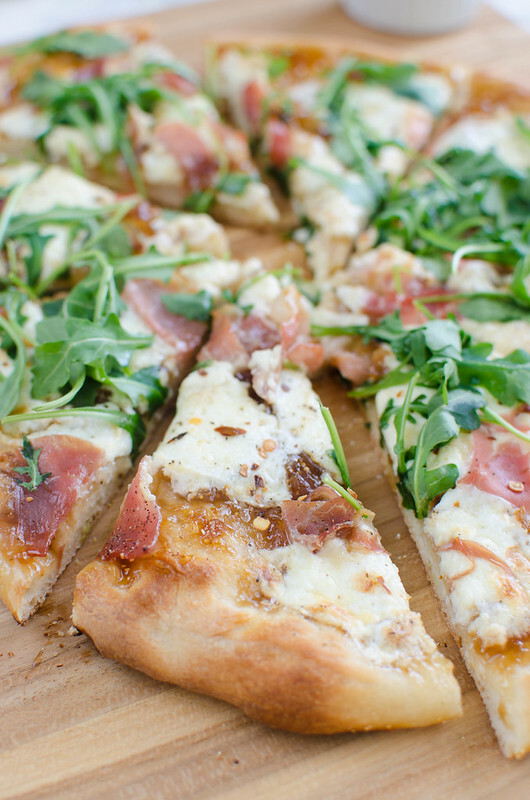 One Response to "52 Pizzas – Fig, Burrata, and Prosciutto Pizza"
Hi Amanda! I love your love of Korean food! You mentioned japchae and now I’m starving. Have an excellent week!